Well, we did it. It took way longer than expected, but we finally finished up all of the pedal and steering mounts. Besides all the cutting and grinding and welding, the job required a lot of machining, which is a serious challenge when you don't have machines. The belt sander filled in where it could, as did our set of files, and the results weren't too bad, but of course it took forever. The pedal box support looks like something we could've turned out on a mill in about 5 minutes, and I suppose if that's what people want to think, we'll just leave it at that. 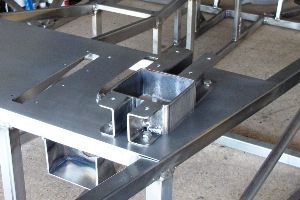 The final arrangement of boxes and brackets isn't a lot different than the design we came up with last March. Getting everything to fit was an exercise in fudging, moving things around a little bit at a time until nothing interfered with anything else. 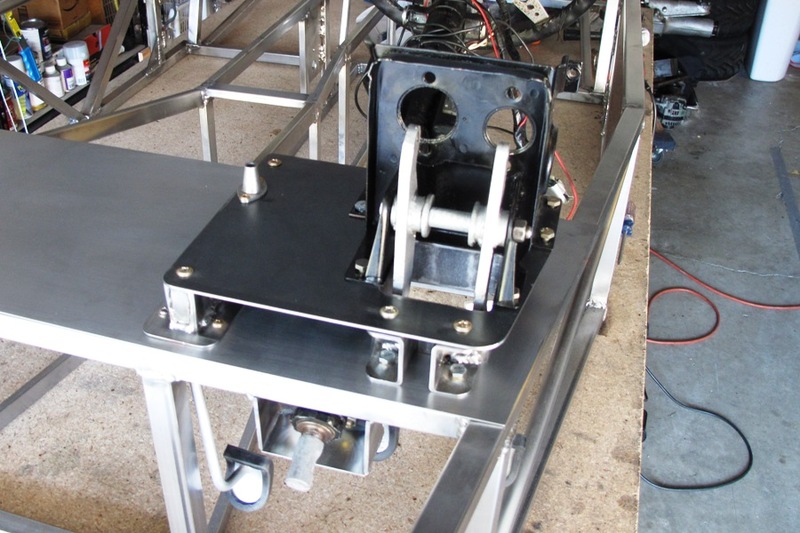 After drilling all of the holes and bolting everything together we ended up with the gas pedal about 1/2" lower than the brake and clutch, but that shouldn't be an issue and it's something we can always change down the road. That's the beauty of bolting everything together. Speaking of bolting, we just received an amazing and very generous contribution of assorted AN hardware from my robot- and airplane-building brother. Four huge boxes of just about every size and length you can imagine, plus all types of nuts and washers. AN bolts are excellent not only becasue they're as strong or stronger than grade 8 hardware, but also because they look cool with their cad plating and short threads. So I dipped into the collection of hardware for all the nuts and bolts on the pedal mounts, and they do look pretty darn good. Cross-tube might be the answer here. Or not. With the pedals done, we're back to working on the suspension. We fully welded all the pickup brackets last week. Some of them still need gussets, however I'm not sure exactly what kind. Originally we'd planned to use triangle gussets behind the rear pickups in front, but now it looks like running a cross tube between them would be a better idea. Each pickup would reinforce the other one. The only problem with this is, 1) The tube might interfere with the engine somehow, and 2) I haven't seen anyone else doing it. That's never a good sign. Of course most Locosts use straight-up brackets in this location, and they can't be reinforced with a cross tube, so maybe that's the reason we haven't seen it before. In any case we're comfortable putting off the decision for awhile because we can't finish the suspension until we have shock brackets, and we're putting those off because we're pretty confident we'll mess them up. 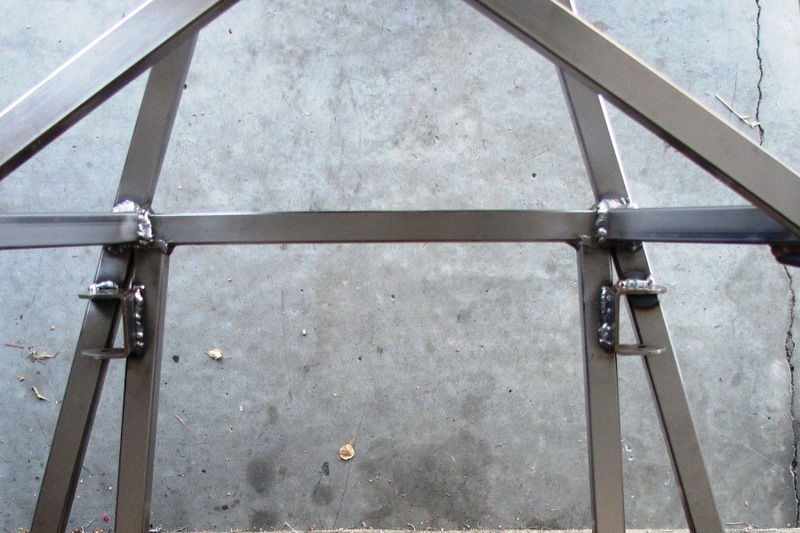 The brackets need to be precisely cut so they'll lean back at a five degree angle, and at the same time create an overhang that will follow the angle of the upper frame rails. We tried making one a few months ago and it didn't work out so well. 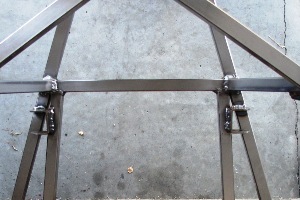 But now we're slightly encouraged by the fact that we made a steering column bracket that fit at just the right angle. Of course we only had to make one of those. With two shock brackets, the odds of ruining at least one is more than doubled. I know it seems like mathematically the odds can't be more than doubled, but trust me, that's how it works. So we're holding off on the shock brackets so long as we have something else to do. And we have many something elses to do. Right now I think we can safely work on the rear suspension, starting with taking apart the rear axle.